100% TeeChart Pro VCL / FMX source code is available as an option. The TeeChart source code supports Embarcadero Windows IDEs (RAD Studio, Delphi and C++ Builder) and now includes native code FireMonkey support enabling you to use common sourcecode to compile your applications for Windows, Mac OS, iOS / iPhone and Android. The Chart graphical code speaks directly to Windows GDI API. Data is stored in dynamic arrays that are very closely mapped to memory which makes access and modifying the arrays almost as fast as the computer processor. The code is streamlined as much as possible to increase internal speed, especially when re-drawing. Other rendering outputs are OpenGL (3D), SVG, DirectX, etc but they aren’t as fast as plain old GDI for realtime charting. A chart using the basic styles ( line, bar, area, pie, point ), has an executable size of only 190Kb. Packages (groups of units), are logically grouped depending on the category of each feature. Developers can create custom packages or .Net assemblies to group modules as per their own needs. TeeChart includes powerful and complete editor dialogs, for almost every component and sub-component. These editors are available at design-time and also at run-time. 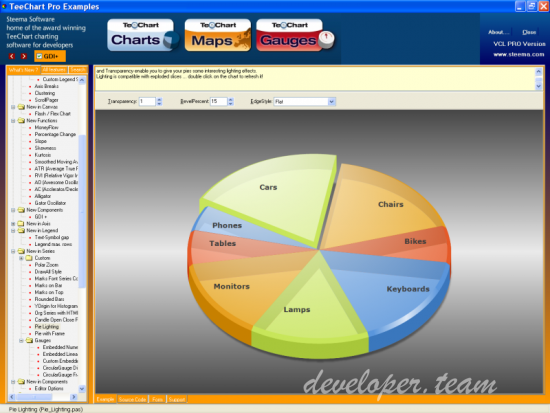 The TeeCommander component (a toolbar with charting specific buttons) provides one-click access to TeeChart editors, print preview dialogs and common features. The architecture of TeeChart is fully Object Oriented. Almost everything is an object or belongs to an object class. Properties, methods and events follow a general, consistent style. Technically speaking, TeeChart Pro consists of 161 modules (units) and 90 form screens, totalling 798 object classes. Each class has properties that in many cases are other sub-classes, either from TeeChart API or from Embarcadero’s VCL set of classes. The help file and documentation include a reference guide, a user guide, demos with detailed “how to” explanations, end-user help and a comprehensive example project (with complete sources) that contains 376 forms. The TeeChart help file follows the look and rules of Embarcadero’s help system and is completely integrated at design-time from the development IDE’s. Pressing F1 gives context help for almost all screens and source code elements. Using the TeeGDIPlus component allows persisting settings, like antialiasing and default text quality. Any color (pen, font, gradient, brush, etc) is now treated as a proper 32bit color with RGB and Alpha components. The only limitation is pseudo-colors can’t be used (clBtnFace, clWindow, etc). Setting a color alpha transparency can be done at design-time using the chart editor dialogs. Using IDE Object Inspector is also possible, but in VCL there is a limitation that TColor is a signed integer, and so values greater than MaxInt (2^31-1) cannot be manually typed (the Object Inspector raises an exception). GDI+ has line antialias, which produces much better looking charts, without jagged diagonal and curved lines and polygon boundaries. There’s a speed penalty when using antialias that is not a problem unless you’re plotting many many points and/or performing animations. The base TTeePen class has a new Fill property (of type TTeeBrush) that is only functional when using the GDI+ canvas. Wide borders and lines (of width 2 or more) can now be filled with textures and gradients. GDI+ uses brush images to fill polygons, rectangles and rounded rectangles with better speed and output results than GDI. Grid lines can easily be changed again to be non-solid, using the axis editor dialog or Object Inspector. With all the new changes, the GDI+ canvas is now faster than GDI in many occasions, as soon you use any effect like transparency, gradient fills, or shadows. GDI is still faster than GDI+ when you dont need antialiasing and any fancy effect, for example when plotting FastLine or Surface series with many many points, but the difference between them is now much smaller, and you can always set back to GDI canvas. As FireMonkey is already using GDI+ or Direct2D in Windows (and Quartz/OpenGL and the new GPU canvas for Mac OSX and iOS), the above list of GDI+ advantages for VCL are also valid for FireMonkey. New editor dialog for j@vascript exporting format. Gradients can be now configured to use multiple colors in FireMonkey and also in VCL with GDI+ canvas (the limit was three colors maximum with VCL GDI). Each color item has Color, Offset and Transparency properties. The Colors property is also used when exporting charts to j@vascript HTML5 and other formats. This technical document describes all changes made to TeeChart component library (FireMonkey and VCL versions) since the release of 21st March 2018.